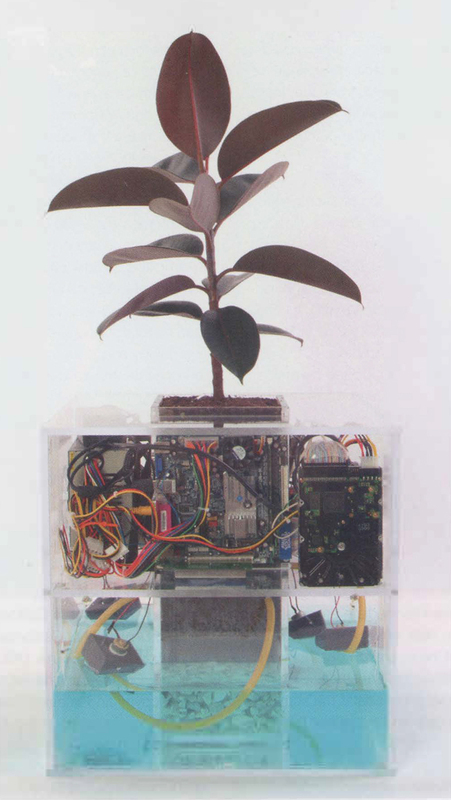 This physical computing project creates an ecosystem for a rubber, tree, where conditions for life or death are controlled by monitoring fluctuations in the price of Home Depot stock. The plant was purchased from The Home Depot, so the project is eligible for the company’s one-year return policy if the tree dies. Spore 1 .1 makes visible the artificiality of our immediate reality by relating the stock market to the ecosystem. Using small-form-factor computing, microcontrollers, and custom software, the life of a plant is controlled with data typically used to monitor the life of a corporation. The primary goal of the project was to find creative expression within a system of control that is systematically monitored through globalization, the growth of multinational corporations, and the loss of heterogeneity and market-driven economies. Another goal was to produce a visually engaging work that shows the familiar form of a potted plant encased within a cybernetic environment that reads as simultaneously unpleasant and bound, yet balanced and harmonious. Spore 1.1 derives creative expression from, and visually exposes, a growing system of control that has steadily been replacing heterogeneous market-driven economies. These systems (or multinational corporations) employ a variety of strategies in the name of consumer freedom (liberal return policies, etc.) but forcefully act as consumercontrol mechanisms on the macroscopic level.Spore 1 . 1 has already died five times and been replaced each time through Home Depot’s one-year guarantee. Unexpectedly, each death was a result of too much water, an interesting consequence that remarks upon the effects of runaway economic growth. While shareholders and executives are enjoying the capital rewards of this growth, other detrimental effects go unnoticed. New Spore projects are in progress, utilizing physical computing technology and data mined from economies of scale. Spore 2.0 will be strategically installed to capture the recent propagation of wireless internet signals radiating from homes and businesses across the country. Internal components will compare signal-to-strength ratios, deploying nutrient-enriched water to encourage fungus growth in non native urban settings.